Typography – ahhh, I even love the sound of the word, and the way it looks in print. Last year I bought a couple-few books on type to add to my bookshelves and to my wee bit of knowledge about this fascinating subject. 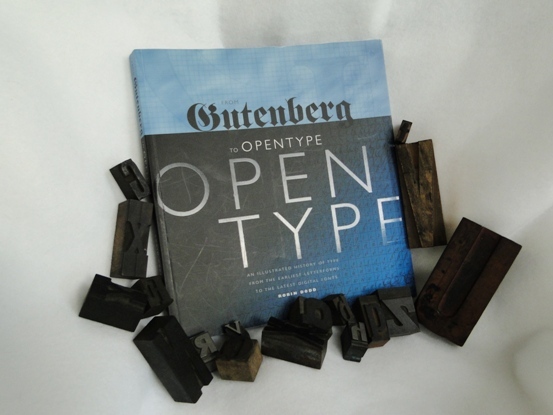 One I’m enjoying working my way through is From Gutenberg to OPENTYPE – An Illustrated History of Type from the Earliest Letterforms to the Latest Digital Fonts by Robin Dodd (Hartley & Marks, 2006). The author is a London design consultant and lecturer specializing in design history and typographic theory. Full of lively illustrations and examples, it’s an approachable, fun treatment of a big subject. In researching a poem I’m working on, I found it necessary to revisit Mr. Gutenberg. Johannes Gutenberg was born around or before 1400 in the German town of Mainz, where he died in 1468. Between 1440 and 1450, he produced the first-known book printed from movable metal types. 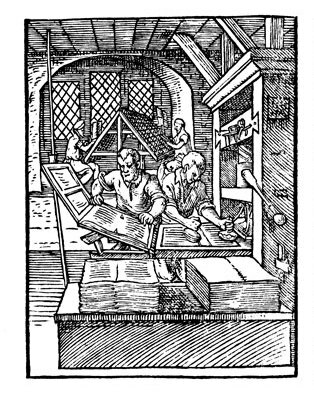 Claims have been made that other inventors in other countries beat him to it, but it’s generally accepted that Gutenberg’s books were the first made this way. His masterpiece was his Bible (completed around 1455), in the Latin “Vulgate” translation, embodying two 42-line columns on each page. 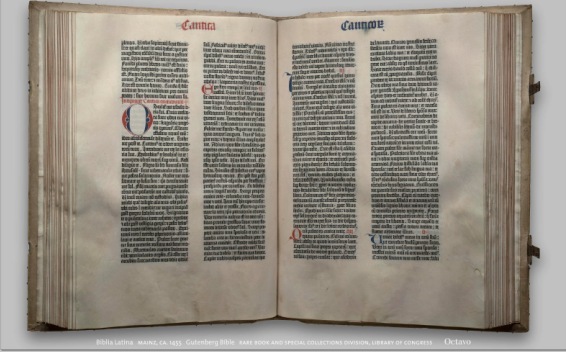 Called The Mazarin Bible, its 1200-some pages were printed in two volumes. Dodd writes that about 180 copies were printed, and about 48 survive. I didn’t realize that Gutenberg sought to imitate the handwritten nature of original manuscripts. Fascinating, no? And somehow it makes me admire the process all the more. As you go about your day and come across the printed word, give a little nod of thanks to our old friend Gutenberg. It would be impossible to imagine our modern world without him. Greetings! I hope your May is blossoming with creative inspiration. On the home front, we’ve been travelling – to Beaufort, S. C. Beaufort was just voted the “happiest seaside town” by Coastal Living Magazine. Home to several thriving art galleries, it’s also on the list of Best 100 Art Towns in America. Sibling Revelry – Seth and Morgan in Beaufort, SC. © 2013 Seth Black. All rights reserved. 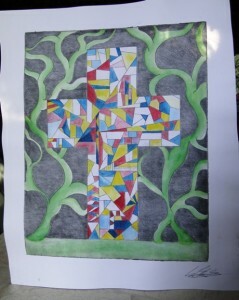 Etching with watercolor. Morgan will be getting her hands messy this summer, too – fulfilling her art education requirements for her elementary education major. She’s quite crafty, so I’ll be able to share something she whips up here soon I’m sure! 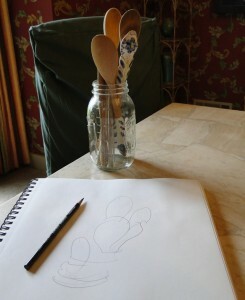 Wishing you creative inspiration wherever life finds you this May, and generous folks to share it with. 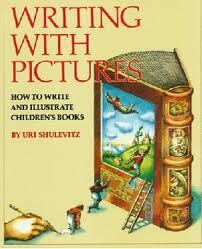 If I had to clear out my shelves and give up all but one book about illustrating children’s books, I’d keep Uri Shulevitz’s classic, WRITING WITH PICTURES – How to Write and Illustrate Children’s Books (Watson-Guptill Publications). I have the bona fide 1985 version, which includes chapters on color separation – a process unknown to young illustrators today, I’m sure! Give up the idea of the perfect flawless picture, and aim for one that is alive instead. The book contains hundreds of examples of illustration that is alive, mostly Shulevitz’s own work but also work by other artists, including many classics. Shulevitz won the Caldecott medal in 1969 for Arthur Ransome’s retelling of THE FOOL AND HIS FLYING SHIP and a Caldecott honor in 1980 for THE TREASURE. Born in 1935 in Warsaw, the young Shulevitz and his family fled from Poland during World War II. He lived in France and Israel before settling in New York to work and teach. Great stuff, no? I have other books on illustration that I treasure, but this one captured me early on and still rings true. Do you have any favorites?